Wellspring was the pattern included in the second installment in the 2013 JANe Garden Club. Flowers and waves flow up the Wellspring Cowl, much like spring water flowing up from its source. 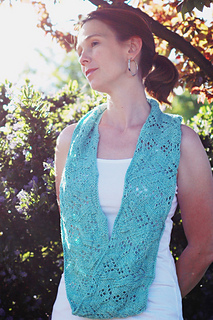 Alternating panels of stockinette and reverse stockinette dotted with lace make the cowl beautiful on both sides. The perfect accessory for an evening garden party; wear it open for a splash of color or double looped to keep off the night’s chill. 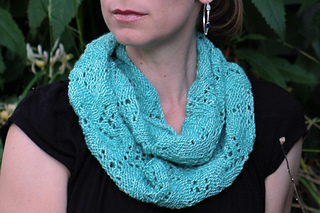 This cowl will bring you a wellspring of compliments, too!